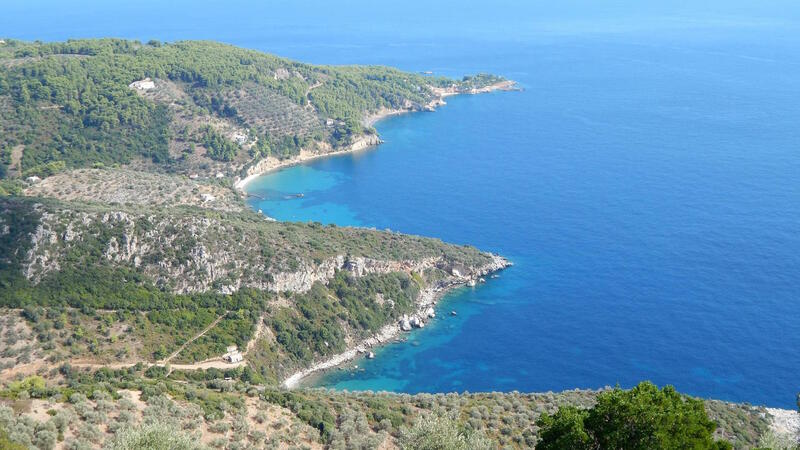 This amazing walk takes you slowly up a traditional old donkey path leading away from Patitiri to Alonissos’ Old Town, a visit to one of the islands’ mountain tops and Micros Mourtias beach. This traditional old cobbled path actually begins with a small concrete road that narrows into old cobbles. It climbs slowly through a small valley and leads you past a natural well before heading further upwards. In the spring the path is a buzz of insects and wild flowers. Approx. 20 minutes up the path it crosses a tarmac road and here you will find some of the most spectacular views of the old village. Continue up the path and you will then come to another tarmac road, continue up the road and you will pass the aloni circles on the right. These were the old traditional corn threshing circles. Keep walking up the road and you will be at the entrance to the traditional part of the village. 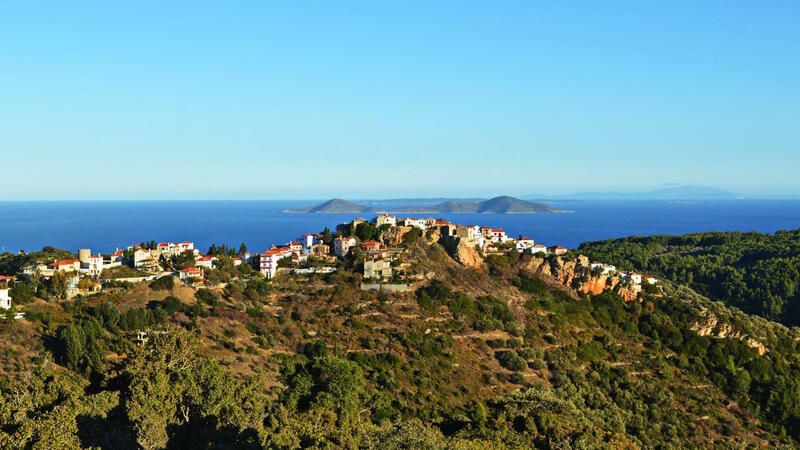 If you wish to go into the village now and explore you can, or you can continue past the village, past the church of Panagia and the island’s cemetery with its colourful memorials on your right. After the cemetery follow the dirt road round to the left and keep going for approx. 500m. Here you will come across a gate to go which takes you right up to the peak of Kalavoulos, the third largest peak on the island (325m). 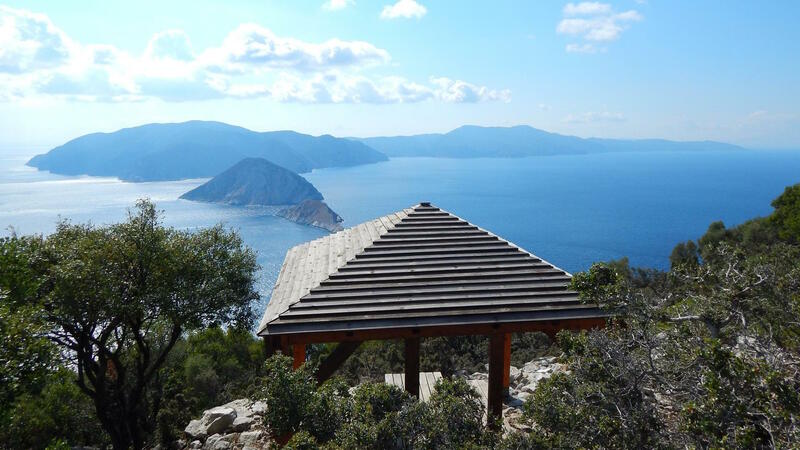 The path will take about 30 minutes to reach the top and boasts some of the most amazing views looking up the island, across to Skopelos island and spectacular sights of the Old Town. Right at the top is a trip point and a walkers shelter. It is an amazing place to sit and watch the sunset. So come back down the same way and once back at the dirt road continue straight on and you will see the dirt road twisting down to Mikros Mourtias beach. 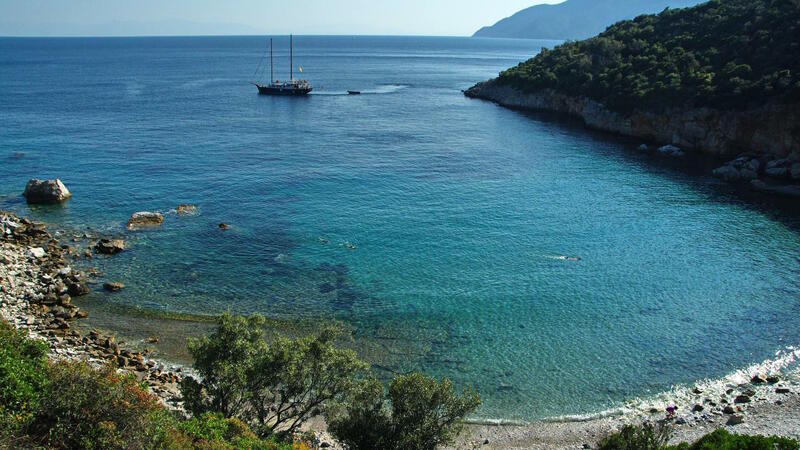 Just before you reach the beach you will see another old traditional cobble path branching off to the left, another old donkey path leading you back to the Old Town. This path will take about 30 mins at a slow pace and bring you to the back of the village by the old school house. Here you are at a great location to start exploring the narrow streets of the magical Old Town. You will find an array of small shops and restaurants offering traditional local dishes. Finally, from within the Old Town, you will be able to find your way back to the entrance of the village to take the bus or walk back down the old donkey path to Patitiri. 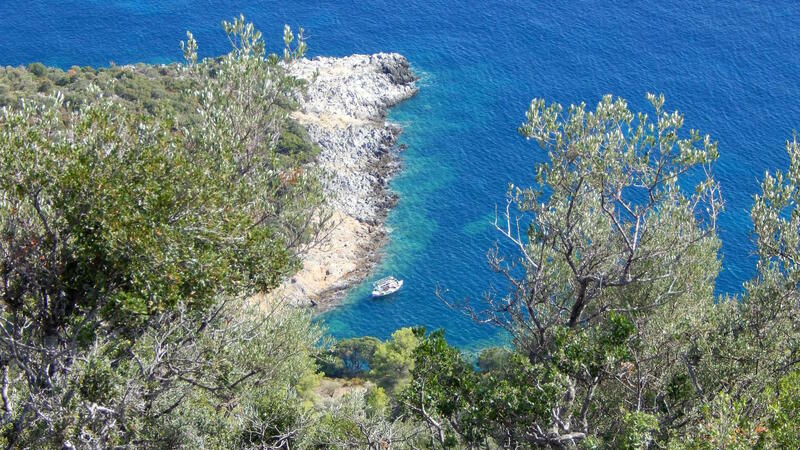 The walk can take a full day at an easy pace with a swim at Micros Mourtias and lunch in one of the Old Town’s tavernas.